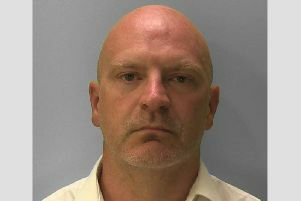 A man has been found guilty of trying to kill his wife and son by setting fire to their nail bar business in Hailsham last year. Ducbac Vuong, 52, known as Sammi, was found guilty of two counts of attempted murder at Hollywood Nails in High Street, Hailsham, on March 4 last year. A jury at Lewes Crown Court heard that emergency services were called to the business at 5.17pm to reports of a fire and a man, woman and baby suffering severe burns. The fire had damaged the nail bar itself, the staff area and the upstairs flat. On Monday (January 18) he was found guilty of two charges of attempted murder. It is believed that Vuong attempted to try to kill his wife, Tram, known as Naomi, who was 21, and their son, who was five months old at the time, and seriously injure himself by starting the fire with acetone liquid. The liquid was poured and ignited by Vuong, blocking all the access points from the nail bar and upstairs accommodation, where the family lived. All three were badly injured with burns and were taken to hospital to be treated. Vuong suffered 47 per cent burns to his legs, chest and hands and was hospitalised for four months and originally given only a 50 per cent chance of surviving. Naomi and the child also suffered severe burns and have undergone months of treatment. Vuong has always denied the offences and claimed he had no idea how the fire started. However CCTV showed him shutting the door to the nail bar after his wife tried to raise the alarm and giving a thumbs up to passers-by who had tried to help. Detective Sergeant Dave Tye, who led the investigation, said, “Vuong has claimed to be the hero in suffering burns while putting the fire out but it was clear to us that he had set fire to the nail bar in an attempt to kill those inside at the time. This may have been a minute of madness as he quickly put the flames out; however he, his wife and child had all suffered injuries by that time and his actions could have killed them all. “The injuries they have all suffered are life-long and will require on-going treatment. They are all lucky to be alive. This is a very sad case for all involved. We carried out a thorough investigation and are pleased a jury has found Vuong guilty of these offences. Vuong was remanded in custody for psychiatric reports and will be sentenced on February 29.